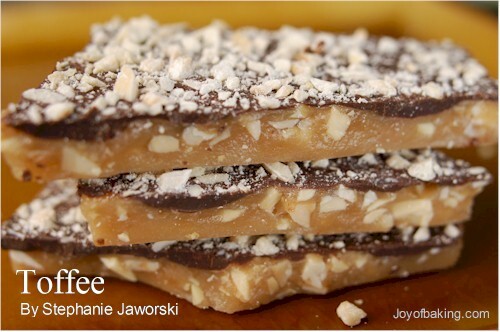 A good piece of Toffee should be savored. Savor its smooth and buttery caramel flavor, its crunchy texture, and its lovely coating of chocolate and toasted almonds. 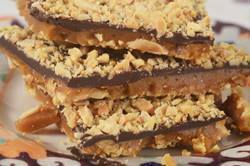 You may know this Toffee as Butter Toffee, or Buttercrunch Toffee, or even as English Toffee. This Toffee is highly addictive and it is almost impossible to eat just one piece. It makes a wonderful gift, packed in pretty gift tins or party bags tied with decorative ribbons. So let's talk about the problems that often occur with candy making. One problem is humidity so do not make toffee on a humid day. Second, use a heavy bottomed saucepan so the sugar syrup will not scorch under high temperatures. Also, buy a good mercury candy thermometer with a metal clip so you can fasten it to the side of the pan. When using a candy thermometer make sure the bulb of the thermometer does not rest on the bottom of the pan as this can cause an inaccurate temperature reading. It is also important to read the temperature at eye level and you may have to wipe the steam off the thermometer first in order to read the numbers. If you think your candy thermometer may be inaccurate, you can test its' accuracy by placing it in a saucepan of boiling water. The temperature should read 212 degrees F (100 degrees C). If you find your thermometer is off by a degree or two, simply adjust your recipe to take this into account. Another thing about candy thermometers are that they are fragile so after each use place in hot water (not cold) to dissolve the sugar coating. Never place a hot thermometer into cold water as this can cause it to break. And be sure to store your thermometer away from other kitchen utensils so it won't get banged around. Lastly, cleaning the saucepan can be a problem. The best way to remove all that hard caramelized sugar is to fill the saucepan with water and bring it to a boil. Turn off the heat and let it sit until the sugar dissolves. Now let's talk about how to prevent your toffee from becoming grainy. Sugar crystallization is the biggest problem in candy making as it will turn a smooth sugar syrup into a grainy mess. This is caused by the formation of sugar crystals which can start a chain reaction of crystallization (the process of sugar particles clinging together) that makes the mixture grainy. So, to prevent this from happening, stir the butter, sugar, water, and corn syrup until they start to boil as this ensures that the sugar has completely melted. Then, stop stirring. Brush down any sugar crystals clinging to the sides of the saucepan with a pastry brush dipped in water. Then clamp a candy thermometer to the side of the saucepan, and do not stir the mixture as it cooks, as introducing a wooden spoon to the mixture as it boils can cause crystallization. Once the toffee reaches the hard crack stage (300 degrees F) (149 degrees C), remove it from the heat, and immediately stir in the vanilla extract and chopped almonds. Then quickly and evenly pour the toffee into your prepared pan. Place the coarsely chopped chocolate, either semi sweet or milk, over the hot toffee. After a few minutes the chocolate will be soft enough to spread with an offset spatula in an even layer over the toffee. Sprinkle the remaining finely chopped almonds over the melted chocolate. Toffee will keep for about 7 to 10 days at room temperature, but make sure to store it in an airtight container to prevent softening. This toffee can also be frozen for about a month. Toffee: Preheat oven to 350 degrees F (177 degrees C). Place almonds on a baking sheet and bake them for 8-10 minutes, or until lightly browned and fragrant. Once the nuts have cooled to room temperature, roughly chop one cup of the almonds. Set aside. Take the remaining cup of almonds and place in a food processor, fitted with a metal blade. Pulse the almonds until they are finely chopped. Set aside. Butter an 11 x 17 inch (28 x 43 cm) baking sheet. Place the prepared baking sheet on a cooling rack. Immediately remove the saucepan from the heat and stir in the vanilla extract and the one cup (85 grams) of roughly chopped almonds. Quickly pour the toffee in an even layer on the prepared baking sheet. Carefully place the chopped chocolate over the hot toffee. After a few minutes the chocolate will be soft enough to spread with an offset spatula in an even layer over the toffee. Sprinkle the remaining one cup (85 grams) of finely chopped almonds over the melted chocolate. Cool completely, either at room temperature or in the refrigerator, and then cut or break into irregular pieces. Store the toffee, in an airtight container at room temperature, for about 7-10 days. It can also be frozen for about a month,. Makes about 2 - 2 1/2 pounds (900 - 1025 grams). Scharffenberger, John & Steinberg, Robert. The Essence of Chocolate. Hyperion. New York: 2006. Weinstein, Bruce. The Ultimate Candy Book. William Morrow. New York: 2000.